Sweet, spicy, savory, all these flavors are present in this dish. Heat a large skillet over medium heat and brown ground beef with garlic in the sesame oil. Drain off fat and add brown sugar, soy sauce, ginger and red pepper flakes. Simmer for a few minutes to blend flavors. If desired serve over steamed rice and top with green onions. Note: you can swap the ground beef for ground turkey. Awesome. I used ground turkey because I did not have any ground beef. 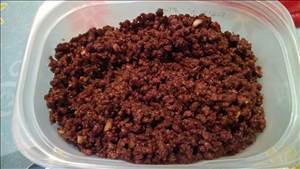 Use lean 93/7 hamburger mince. Casserole that uses meat, bacon, eggs, heavy cream and of course cheese. Low carb/keto meal using spaghetti squash. There are 308 calories in 1 serving of Korean Beef. Calorie break-down: 43% fat, 26% carbs, 31% protein.